This collection happened by accident. We were brainstorming in our art department on ideas for a collection of American landmarks and monuments. There are obviously a lot of different landmarks to choose from, but then the question arose on what we would do with them, how will they look together and what would we stitch them on so that it would look like a cohesive collection. We had the idea of silhouettes that are one color and we decided to place the silhouette on a quilted landscape background. 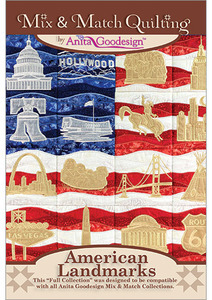 When we placed all of the artwork on our design table we had the idea to make them into a flag background by choosing red, white and blue fabrics for the landscape portion and metallic silver and gold applique designs for the landmarks. The designs pop over the flag background for a truly unique look. Isolated designs are also included so you can embroider them on anything that you like.